Following the news revealed earlier today that the brand new billion dollar Royal Caribbean vessel, Ovation of the Seas, is set to spend part of her debut season sailing out of Australia – we have decided to take a look at the ship and all her fantastic features. The third sister in the Quantum Class fleet, the most technologically-advanced cruise ship class in operation, Ovation of the Seas is set to feature a series of facilities and amenities unique in Australian waters. One of the first things you notice when approaching any of the Quantum Class ships is the massive arm emerging from the top deck. The NorthStar Observation Pod lifts guests 300ft into the air – offering incredible views and seascapes for miles around. The Observation Pod is completely free for all guests to enjoy – operating on a first-come, first-serve basis – although sunset or sunrise bookings can be made for special parties or wedding events. Debuting on the Quantum Class of ships, the iFly series are the first skydiving simulators on the seas. Freely available for all guests aboard the ships, the iFly mimics the experience of weightlessness and free fall in a specially-created wind tunnel. Guests are invited to enjoy two one-minute-long sky dives – one with a specially-trained skydiving instructor and one solo flight. The iFly is suitable for all ages from young children to OAPs. When developing plans for the Quantum Class ships, the Royal Caribbean team looked at making almost every aspect of the experience more intuitive and exciting. Even the bar service has been given a makeover in the Bionic Bar – where cocktails are mixed up by automated robotic arms. Simply place your order via a bar-top tablet device and the robotic bartender will accurately mix up the cocktail to your specifications in front of your eyes. The Two70 Lounge has proven to be one of the most popular haunts for guests on the Quantum of the Seas since its launch last November and the Ovation’s version promises to be equally popular. Set in the rear of the ship, the lounge is so called because the huge panoramic window offers 270° views. The versatile room has been designed to offer unique experiences during the day and through the evening. During the day, the lounge is an idyllic place to sit and relax with a coffee and the day’s news whilst at night, it turns into an exciting entertainment venue. Incorporating some of the same technology as the Bionic Bar, the Two70 lounge combines live music, theatrical performances and videos projected onto moving screens controlled by robotic arms. One of the great problems the cruise industry has struggled to overcome over the past decade is providing fast and reliable internet access to thousands of passengers who are hundreds of miles out to the sea. Royal Caribbean believe they have solved this issue, offering the fastest internet speeds aboard any cruise ships. Partnering with O3b Networks, the Quantum Class ships became the first cruise ships to accommodate an internet connection fast enough to allow passengers to video chat, stream movies and share photos at a speed comparable to a land connection. This improved internet connection has been developed to benefit the crew as well passengers – with all members of the team having access to high speed Windows tablets which contain helpful information about all the guests – helping accommodate a more personal service. 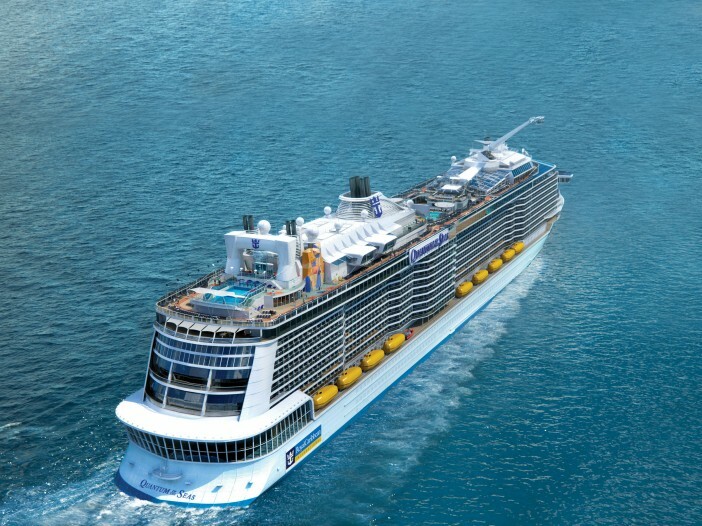 Launching next week, the Anthem of the Seas will become the first ship in the Royal Caribbean fleet to feature a Rotational Dining service – wherein guests are booked in to the six complimentary restaurants night after night in rotation. In addition to the complimentary dining options, there are more than a dozen different eateries – accommodating all palates and moods. One of the highlights of the dining options is set to be Jamie Oliver’s eponymous Italian restaurant. The British chef spoke glowingly about the opportunity to cook for the Australian cruise industry. The Ovation of the Seas will move to Sydney in December 2016, and a full list of itineraries is set to be released shortly. Cabins aboard the vessel are set to go on sale midway through this year. Click the button below to sign up for regular updates about the Ovation of the Seas and special deals from Cruise1st.